The Chowan County Regional Fair is good, clean, wholesome family fun. Located at the American Legion Post 40 on West Queen Street in Edenton, NC, the Fair offers rides for big and small, a variety of delicious foods, exhibits of local talent, and professional entertainment. The emphasis of the fair is on education of young and old through exhibits and displays. Free parking is available with tram rides to and from the parking lot and the Fair gates provided by the Edenton and Rocky Hock Lions Clubs. So, pack up the family and come on down and enjoy a memorable evening. 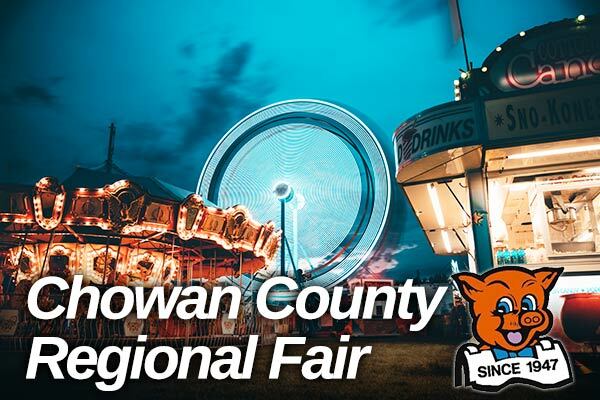 The Chowan County Regional Fair was first held in 1947 as The American Legion Fair. Since that time it has grown into one of the most respected fairs in the State, winning many awards, culminating with the prestigious Image Award for best medium sized fair in North Carolina in 2007.